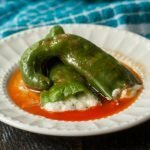 What's better than some Buffalo Blue Cheese Stuffed Anaheim Peppers using fresh peppers from the garden! This easy low carb appetizer will please all of the hot sauce lovers in your life. In a bowl, mix the cream cheese and blue cheese and set aside. Clean out the ribs and seeds of the peppers. Bring a large pot of water to a rolling boil and place peppers in. Cook for 4 minutes and then take out and place into a large bowl of water with ice cubes in it. Take them out and dry off a bit. Stuff with cream cheese mixture and then place in the oven to bake. In the meantime, bring the hot sauce, butter and garlic to a boil and then simmer for a few minutes. Pour the sauce over the peppers when they come out of the oven.